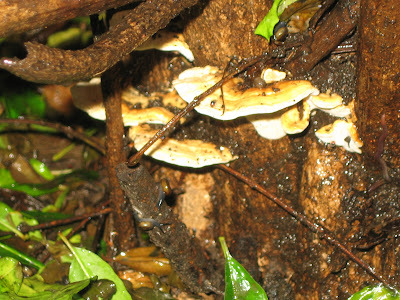 Monsoon is the season of life, and we see the growth of all kinds of life all around us..... Not even the dead or dying wood is spared, if you notice these bracket fungi growing on them. This first one is growing on our pomegranate tree, and it is sad to think that the arrival of this fungus means that our tree has not much longer to live.... Of course, it had never been very healthy, not one of its small pomegranates growing into fruits ripe enough for us to taste. Meanwhile, we are making the most of this opportunity to learn about these forms of life too! This one grew on a rotting log on the side of the road. I noticed it one day as I went by, and remembered to take my camera along the next day to take a picture. Thankfully, it was still there then, but was gone the very next day! I remember my very first walk into a jungle and our guide pointing out these interestingly shaped things... I even remember bringing back a piece with me (which crumbled in a few days). I remember how thrilled I was then, to see something 'wild'!!! Imagine seeing the same thing in my garden now!!!! Maybe too much of rains - The reason. Anyways, thanks for sharing. At-least someone is thinking about them. Never knew fungi spoils the tree. We call them 'Bebai sathuli' meaning frog's umbrella. The last picture is like a flower. I always enjoy watching mushrooms that sprout everywhere in this season! Thanks for telling me more about them. Some of them are edible, but of course don't try them. Some are known to be poisonous too. Fantastic captures. As a kid I used to see these a lot. Now I do not see to get them much. 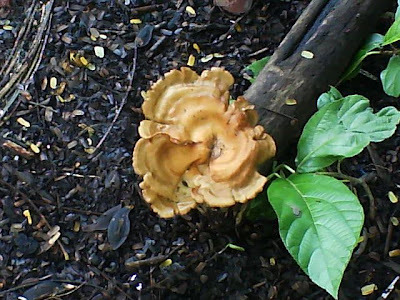 Is fungii so dangerous to the tree?